On Sundays, my daughter and I try and make something sweet for the week. We call them “Sunday Sweets”. 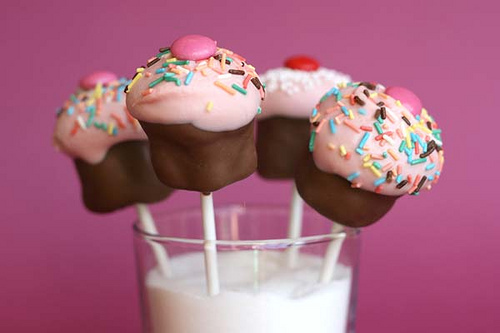 Always looking for a new twist on old favorites, I recently came upon a trend that I am far behind on…cake pops! How cute are these! As it is Spring Break for those of us with kids in school, this week is dedicated to ease and fun. If you are looking for an activity, maybe you could try your hand at making a sweet treat for the week. What MindFULL twist did you add to this new twist on an old favorite? Let us know! Both got me wondering about going easy on ourselves. A simple concept complicated by inner voices and pre-conceived notions. However, rather than ponder, I am taking this MindFull Monday to simply surrender. Please join me. For one day, Let It Be. Let YOU Be. How about if we say the Song Of The Day is Let It Be…come on, hum it with me. When ever a stab of something comes to mind today (it comes in different forms for all of us) hum a few bars and turn on the ease. For one day. Let It Be. How do you MindFULLY find ways to Let It Be? Let us know! Today’s MindFULL Monday Musing finds us pondering what we can do when we we hit the mid-afternoon lull. Lamenting my 3:30pm tiredness last week, my muse and Pilates instructor, Alison Franco of Pilates with Alison& Friends , mentioned there are a few quick moves I could do that might help give me the energy boost I am looking for. You can do these NINE Pilates moves almost anywhere, in just FIVE minutes! Read on for a few of her favorite mid-day refreshers demonstrated by Susan Ely, friend of the studio and avid Pilates practitioner. Although not a ‘belly buster’ series, these movements do call on and develop core strength, while their key benefits and concentrations are varied. I hope the simplicity of the moves below will inspire you to take a few minutes to be good to yourself today. You don’t have to put on your exercise clothes. Just take off your shoes and hit the floor — a few of Alison’s moves will help keep you from being scraped off of it. Pilates ‘Hundred’ – increases blood circulation, oxygenates your entire body, core focus. REPEAT entire set 5 times – or until you’ve completed “50” arm pumps. Focus on core, abdominal control, and ‘scooping’ the belly in, suction cupping navel to your spine – especially as you exhale. May also be modified to table top leg position shown in second photo. 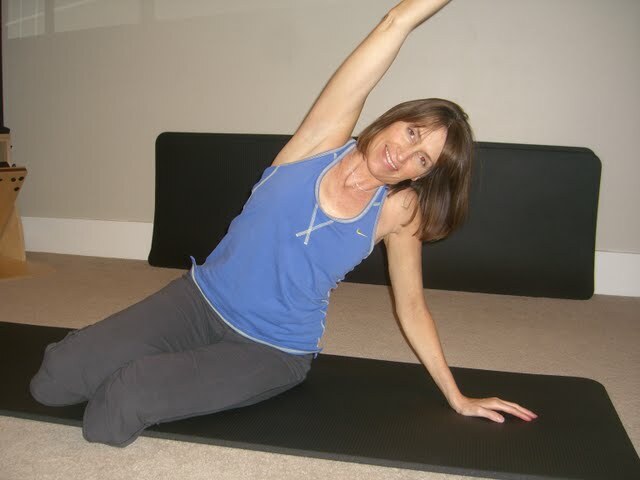 Improves flexibility (lower back, legs/hamstrings), spinal flexion – and it feels ohhh so good! Lie flat on your back, spine against the floor, hands reaching overhead. INHALE as you slowly roll up off of the floor one vertebrae at a time, reaching hands forward over your feet, creating a C curve or a horseshoe shape in your lower back. EXHALE at exertion, and as you deepen stretch. INHALE as you being to roll back down, ‘lead weighting’ the small of the back to the mat, followed by each successive vertebrae, EXHALING as your shoulders touch the mat. REPEAT 5 times. 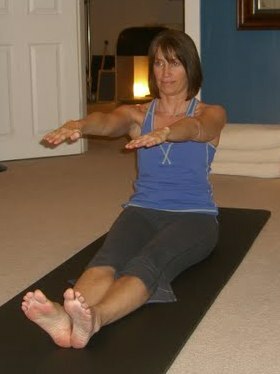 3) SINGLE STRAIGHT LEG STRETCH Great leg stretch/lengthener, cardio component if down briskly. Lie flat on your back with both legs extended long, feet up to ceiling. Grasp the back of your right calf with both hands, lower left leg to 45° angle. Lift head/chin to chest, roll shoulders up off of the mat. Widen elbows tugging right leg back towards you, pulse it twice. Switch legs, pull left leg towards you and pulse twice. REPEAT 5 sets/times. Breathing pattern is long and controlled, INHALE SLOWLY as you pulse pulse right, pulse pulse left. EXHALE SLOWLY pulse pulse right, pulse pulse left. Pace is brisk, this one should warm you up! 4) SOFT TOWER AT WALL Wonderful lower back opener Lie on back hands extended at side, with rear end snug against base of wall. Legs extend up the wall, soles of feet rest on wall hip distance apart, knees are softly bent. INHALE as you slowly begin to curl your pelvis inwards, lifting it from the mat. Continue rolling up to neutral bridge position – mindful not to arch lower back. EXHALE as you slowly roll down to the mat. Timing = 8 count to roll up, 8 down. REPEAT 3 times. Lateral extension/stretch, obliques. Sit upright facing side of mat – both legs curled at your right side, knees and ankles stacked on top of one another. Hold right ankle with right hand, left hand reaches up to ceiling, overhead. INHALE as you stretch right, up and over your legs, EXHALE to deepen. 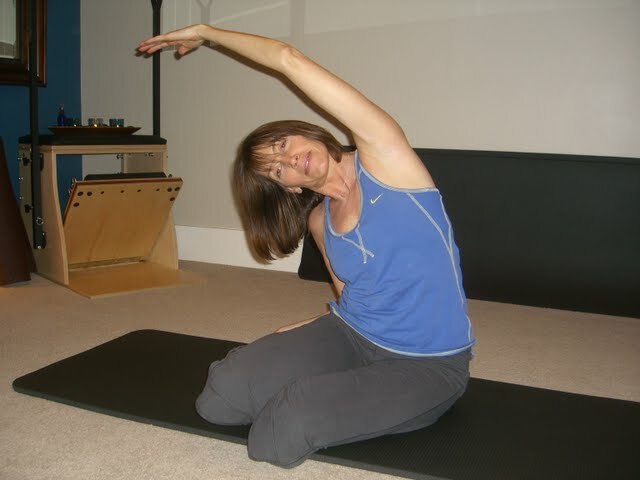 INHALE, lift posture upright as you windmill arms overhead, left hand to mat at your left side, right hand reaching overhead stretching to left, EXHALE to deepen stretch. INHALE back upright (engaging obliques to lift) beginning the stretch to right side. REPEAT 3 times, change sides, REPEAT 3 times. Sit upright and tall on mat with legs and arms extended long in front of you, heels glued together. INHALE as you rotate to the right opening your arms to a T position, growing taller, twisting further – be sure your heels don’t slip – keep them firmly connected. EXHALE back to starting position. INHALE as you twist/open left, EXHALE back to center starting position. REPEAT 3 times. *Not advisable for anyone with active back pain, instability, or injury. Extension of spine Lie face down on mat, hands palm down directly under shoulders, legs zipped together and extended long behind you, forehead to mat. INHALE as you reach forward with crown of head, engaging abdominals to support spine, slowly lifting yourself off of mat in an arch, widening chest. EXHALE as you reach forward with head/neck, slowly lowering back down to mat. This should not be felt in lower back, as abdominals are engaged to support – discontinue if you feel any lower back discomfort. *Not advisable for anyone with active back pain, instability, or injury. 8) Child’s Pose Low back release, complimentary to Swan. After completion of Swan, sit back on your knees, resting buttocks on or near heels. Place forehead on or near mat, arms extended out long in front. Breathe deeply, at least three deep breaths, relax. 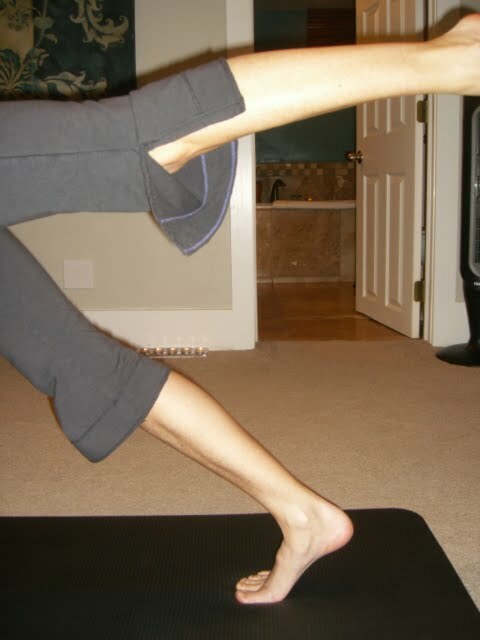 Stand upright at one end of your mat, facing the length of mat, with feet in a soft external rotation/heels together. Lift arms overhead. Keeping tail/bum tucked, slowly ‘pour’ down the front of your body like a waterfall, until your hands reach the mat – keeping slight softness in knees. Walk your hands out the length of the mat, until you reach a plank or push-up position, supported on hands and balls of your feet/toes. Be sure to engage abs, creating a ‘sheet’ of support for the lower back, no sagging in lower back – if you need to, elevate hips slightly. Lift your right heel off of the mat high towards the ceiling, stretch your left heel down towards the mat, then return left heel to neutral position and lower right foot back down to mat. Switch legs and repeat. Walk hands back in towards feet, slowly roll up the front of your body until you are standing upright again. REPEAT sequence twice. Upon completion of second set, while standing upright, reflect on your posture. Engage abdominal ‘scoop’, roll your shoulders (up, back, and then down- maintain the latter ‘down’ position, this is good posture). Take note of how you feel. Better than five minutes ago, right? Hopefully lighter, more supple, invigorated, and maybe even a little taller! How do you MindFULLY get a mid-day energy boost? Let us know!